Facette blinds have alternating vanes of opaque and translucent fabric. 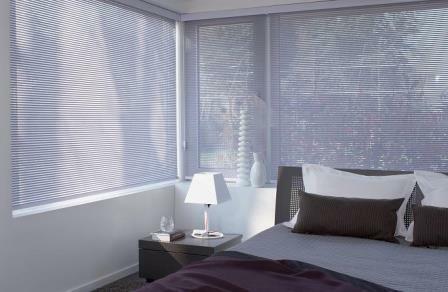 Facette window blinds create a unique soft effect allowing light to penetrate gently into your home. The clean, space-saving design offers the convenience of a shade, complemented by the beautifully understated elegance of textile composition. Choose the ideal balance between light and privacy at any time of the day. A continuous chain allows you to slide the opaque and transparent woven fabric panels past each other to open partially or completely close the shade. A diverse range of colour options are available to enhance your living space.